Learning goals should be clearly posted in your library each day for each class. When crafting your lesson plans, your learning goal should should be the driving force. Remember, there are student friendly learning goals already created in the Pacing Guide sections of the A+ Curriculum Guides (located in our Library Services Notebook). Those student friendly learning goals will grow and change as we continue to work with the new AASL standards and our state standards. You can also refer to Section 2 of the Best Instructional Practices Handbook for additional guidance. As you progress through the lesson, be sure to reference the goal where it feels natural. Ex--During a transition between activities share with or ask students how what you just completed or what you are doing next supports the learning goal. Learning goals are an essential component of a guaranteed and viable curriculum. They help guide student learning and provide focus for daily instruction. Take a moment to look through the slides below to learn more about crafting learning goals. The flip book featured above should be available in your buildings. 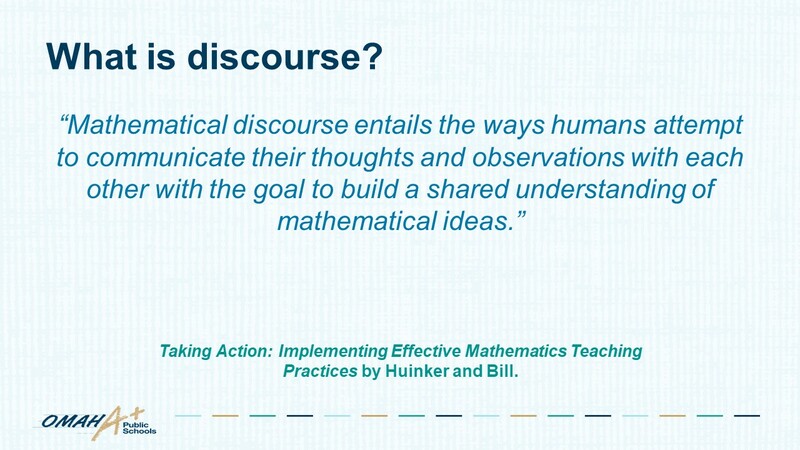 The slides below are part of a presentation that was shared at the principals meeting on Tuesday regarding academic discourse in mathematics. As with growth mindset and productive struggle, academic discourse is a skill that can easily translate to instruction in the school library. One easy way to ponder this is to replace the word math or mathematics in any of these quotes with the word inquiry. Allowing your students time to discuss what they are working on with each other in relation to inquiry will provide the same benefits that it would during mathematics instruction. 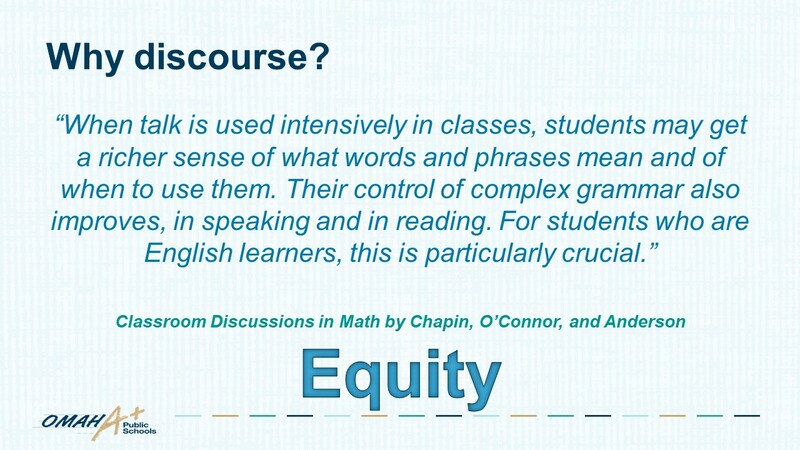 1) Students can develop a shared understanding about inquiry through discourse. 2) Students can use language to process their thoughts on components of the inquiry framework, sources available for curating information, evaluation of sources, and creation of final products. 3) Students can learn from each other with struggles or failures in the inquiry process. If students are exploring the same inquiry topic--through social studies or ELA projects--they will have common ground on which to share their successes and struggles. 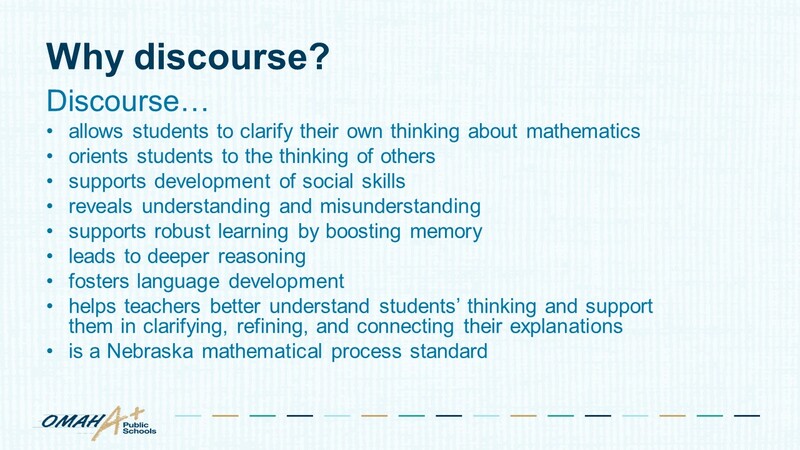 Just look at all of the bullets in the last slide on why discourse is helpful for students! Goal: Think about how you can add 5 minutes of academic discourse to your daily instruction. Where can students discuss and learn from each other? Or, where have you already added in academic discourse? Are you seeing some of these benefits? If not, are there adjustments you can make? How is your academic discourse supporting your learning goal/standards? Is the emphasis on giving the right answers rather than processes and strategies? Do the verbal interactions follow the teacher-dominated initiation-response-evaluation pattern? Is discourse carried by the voices of a few where the others are reluctant to contribute? Do you often provide opportunities for students to lead the discourse? Do you model and insist wait-time be used as a key component of dialogue? Do you send non-verbal signals to students based on your perception of their ability to give a quick or correct response? Does your lack of comfort with content lead you to pose more close-ended questions? When you create a classroom culture rife with intellectually safe spaces and emphases on processes of strategic thinking versus production of right answers, you invite instructional episodes of rich discourse. 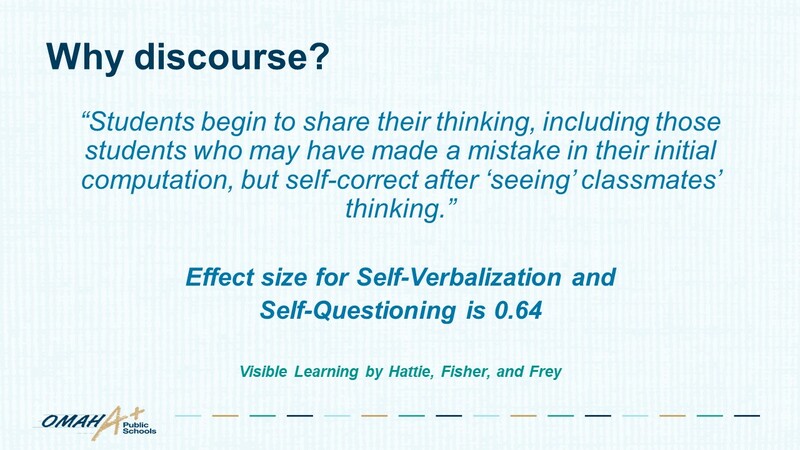 Student-led discourse is a powerful way to let students take ownership of their own learning. 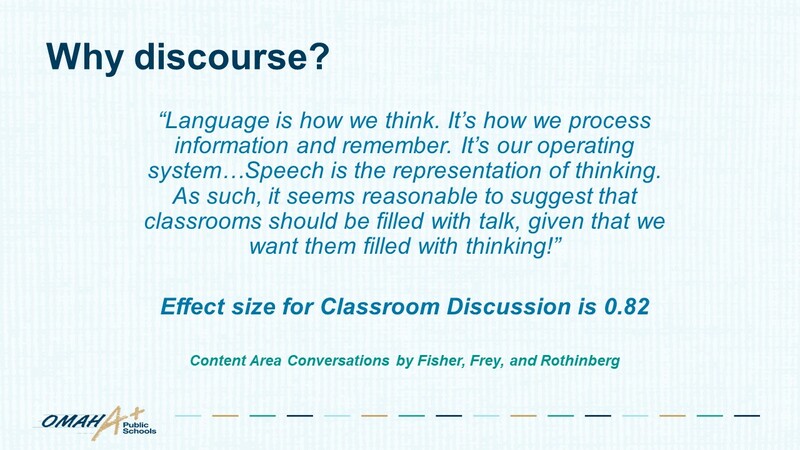 Full Article--How Rich Is Your Classroom Discourse? Academic discourse is not something that comes easily to most students; rather, it is something that needs to be taught, modeled and recognized by both teachers and students. With strategic instruction around what academic discourse sounds, looks and feels like, it can be a useful tool that enriches all classroom interactions and facilitates deeper learning and retention. Over the past year, we have established that increasing academic discourse also increases classroom engagement. When students are more likely to interact with their peers and take part in discussions, the long-term benefits of their understanding of the material are apparent in other math courses.